American history is amazing! I’m always surprised to hear of people who don’t find history fascinating. Real-life history is just as action-packed as any current Hollywood movie. I know, however, that in schools, many kids don’t enjoy learning about history. That’s where “Uncle Sam’s Comedy Jam” comes in! Your students will be captivated from the moment they enter the assembly area and see the beautiful set design – patriotic banners, backdrop, and patriotic music playing. And then when the show begins, they see me…dressed like Uncle Sam in patriotic clothes and hat! Believe me, this school assembly is unforgettable! 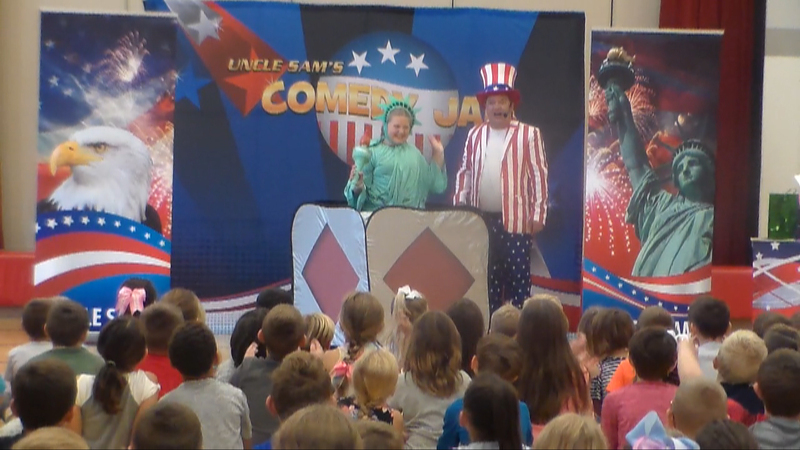 This one-of-a-kind assembly program focuses on the incredible chain of events that led to the writing of the Constitution – but the way we get there is what will have your kids laughing, clapping, and cheering the wacky stunts, comedy skits, magic, and birthday presents. Birthday presents?! Yup. At the end of the assembly, ten students are invited to the stage to open ten birthday present gift bags to reveal the ten gifts that our Constitution gives us every day. It’s whimsical, fun, and most of all, memorable. Oh, did I mention the Statue Of Liberty makes an appearance? It’s true – she magically appears from a giant empty giftbox in the beginning of the show! Okay, I confess – it’s not the REAL Statue of Liberty… rather, it’s one of YOUR students dressed up in a Statue of Liberty costume. It’s an incredible moment your students and teachers will remember for years! There’s plenty more, too – The three branches of government become a “dangerous” stunt that guarantees your students will remember that the concept of “balance of power” each of the three share their powers equally. Powerade becomes a fun way to help the kids learn about popular sovereignty. 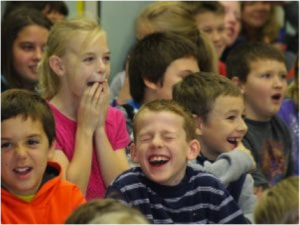 You’ll watch them scream with excitement and your teachers will praise the way the comedy, stunts, and magic illustrate these lessons. 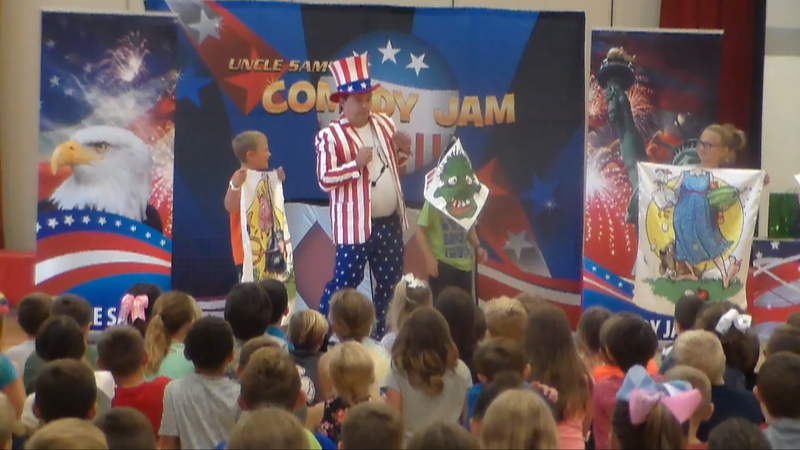 Your school’s teachers will love “Uncle Sam’s Comedy Jam” because of the federal law that requires schools to teach the U.S. Constitution each school year. 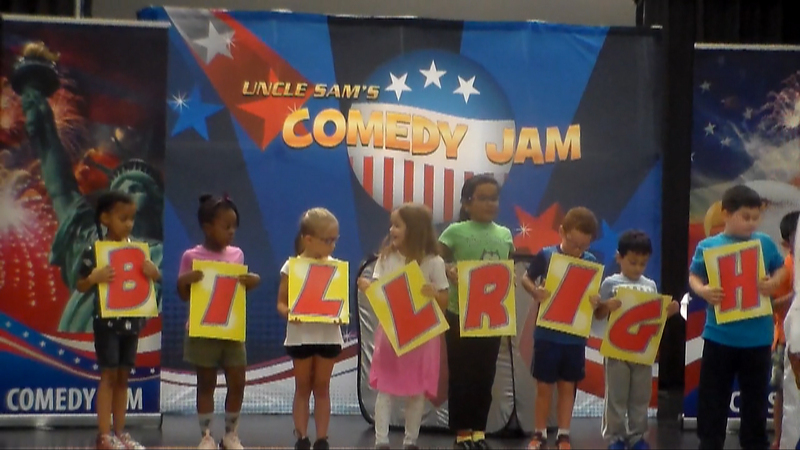 Well, the “Uncle Sam’s Comedy Jam” school assembly fulfills that need and takes pressure off of your teachers… and it’s hysterical fun, too! As you know, Constitution Day is September 17th (thus the dates in the beginning of the school year always sell out) but this school program is perfect for any time of the year when your school wants to focus on American history in a fun way. This program is great for the dates around Memorial Day, Presidents’ Day, Veterans’ Day, elections, and so much more. And, as a “freebie,” I’ll even send you Teacher Support Materials your teachers can use to satisfy the federal requirements. Give your teachers a gift and make their jobs easier by scheduling this American History assembly show for your elementary school. I promise your teachers will thank you and your students, from kindergarten through sixth grade, will have a great time…guaranteed! Call me at (716) 940-8963 (that’s my cell phone) or fill out the Contact Form above to have “Uncle Sam’s Comedy Jam” emailed to you instantly! “I love how engaged the kids were during the entire performance and how funny he was.” “It was a great show.” “He kept the kids engaged and excited.” “He was entertaining and engaging.” “He played very well to our primary audience.” “Comedy was very appropriate for our building.” “The kids loved it.””It was awesome and super kid friendly.” “We loved him and hope he comes back.” “I loved the connections to reading and the magic words.” “Very engaging.” ” I liked how he included the audience participation.” “Super Cute! !” All of the teachers who responded to our survey, said they would like to have you again. Thanks again and we look forward to having you visit the Brockport GInther School again.